To the outsider, the Belgian city of Leuven is notable for 2 reasons: students and beer. The city hosts one of Europe’s oldest Universities as well as the headquarters of the Stella Artois. Given the high student population (nearly 30% of citizens) and the daily coming-and-goings of a major Brewery going about its business, Leuven has become a commuter concentrate within today’s mobilised Flander’s landscape. The proposal to shift the federal administrative power from Brussels to Leuven serves to reinforce the transient nature of Leuven: a city in flux! The Site as Traffic Island. The site for the new Vlaams Administratie Centrum (VAC) is thus seen as a traffic island - a space left-over from adjoining ring roads and railroads. This project responds to these conditions of motion and commotion by seeking to make a place of calmness and tranquility: a desert-island traffic island! Onto this urban void a ‘transplanted landscape’ of trees, parks and gardens (that almost smacks of domesticity) is installed in an attempt to counter the asphalt and concrete. This ‘nature implantation’ does not, however, impede the flow of people, goods and services. 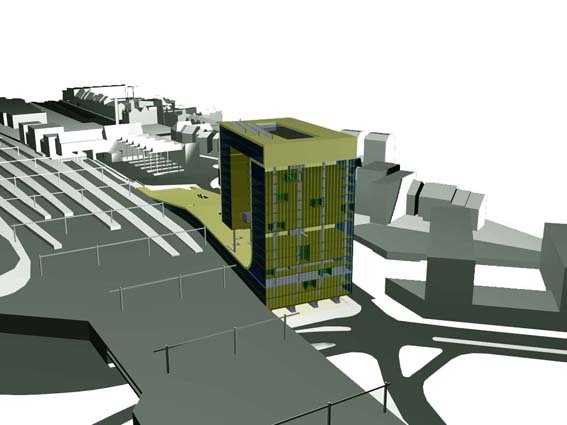 The traffic island is connected to the urban fabric through a number of urban plug-ins: a ramp to the bus station, a platform to the railway station and a bridge over the railway to the new park-and-ride building. 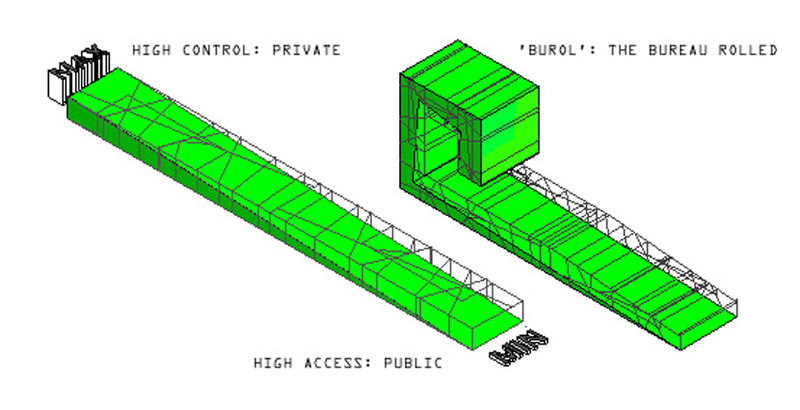 BUROL: An office rolled. 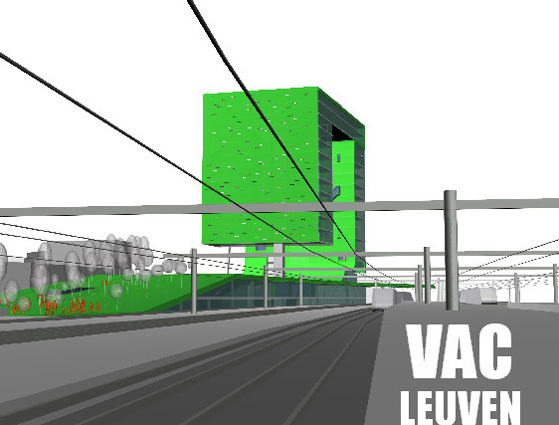 This project is organised around the rolé played by the building's occupant (VAC) and the landscape which it oversees (Flanders). For reasons of political accountability one has to allow access yet control this accessibility so that administrative work is not overly encumbered by the public. The lead to an organisational strategy for the office programme which slides as seemleesly as possible between control and accessibility: from the more public areas (VOI) to those that are private (MVG). This programme is then rolled to create an office configuration which allows high public access at ground level shifting to high control at the upper levels. Where one cannot walk, one can see! Circumnavigate the centre. Walk over, walk under, walk through, walk up. A verticalised pedestrian roundabout building! Gaze from the public cafe down onto the park landscape. Admire the panorama from the energy roof over the historic city of Leuven to Brabant. FOUR BUILDINGS IN ONE! Not one building type but four for the price of one! 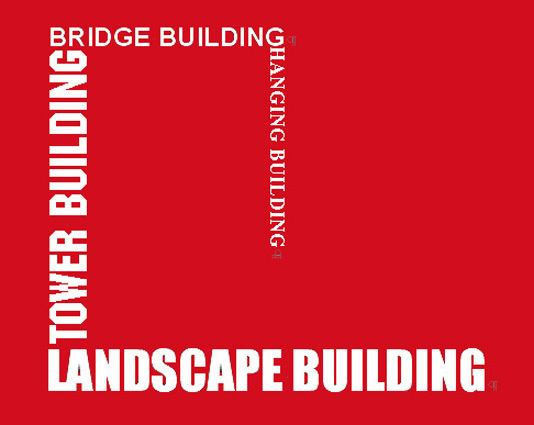 One discovers a Landscape building, a Tower Building, a Bridge Building and a Hanging Building. Each building type has its own structural character. The Landscape building is supported by a column-beam system with V-columns providing additional horizontal stability. 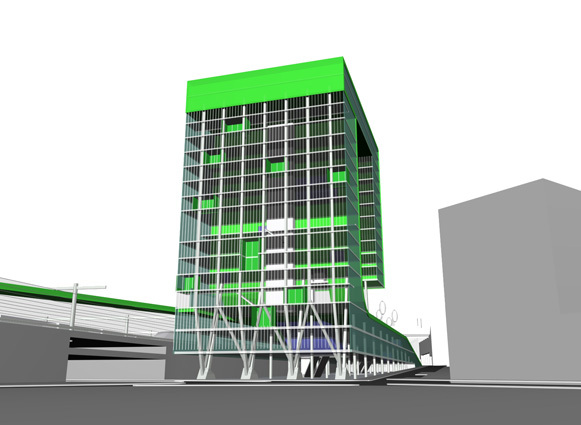 As the landscape rises vertically, it is stiffened by peripheral core walls within the Tower Building. The Bridge Building is noted for its large 'vierendeel' trusses, surprisingly supported by the Hanging Building with its central core working as a 'concrete tree' to allow the suspension of the office floors. NO AIR CONDITIONING! The design features a number of means to reduce energy consumption. Generous glazing of the facades and a narrow floor plan maximises daylight working conditions. On the southern side of the building a 1m deep convection facade traps air heated by solar radiation before it dissipates upwards. This rising hot air draws fresh air through the building from the north side providing natural ventilation. In combination with a cool ceiling the air-conditioned office can be avoided. Co-generative and green water economies are sought by recuperating heat gains for warm water whilst rainwater is captured for non-potable water usage. The public can visit the rooftop energy garden which harnesses climatic energy via 3m high wind turbines and solar panels. Other smaller gardens are sprinkled throughout the VAC providing fresh air, flowers and smoking spaces to the towers and, additionally, light to the landscape building.